At the heart of babblevoice, rules are at the core of how phone calls are handled. They can be used for all sorts of things, but they become more useful when they are layered to form auto attendants. When they become layered, the normal rules table can become a little more confusing to follow from one to the next what will happen. To get a more visual view of how a call maybe handled the Flow viewer can be used. In the babblevoice console, select the rule which you wish to follow. This might be your main phone number. 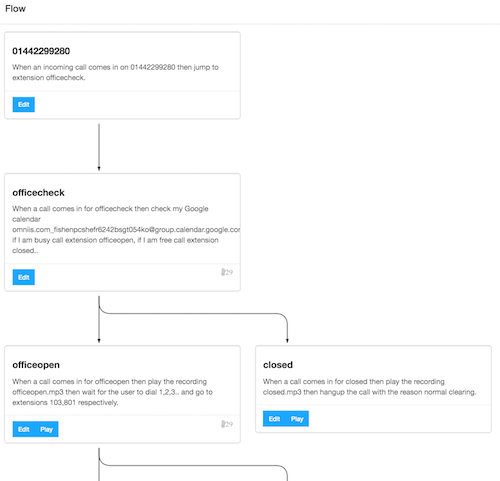 Click ‘Flow’ and the console will render a flow diagram of how the call might flow. Each rule is rendered in order. If a rule has a jump to extension in it and it does not exist it will off you the ability to create it. If the rule chunk has plays a sound file you can click ‘play’ to be able listen to what the caller will hear. which shows the number of times this extension ran in the last 24 hours.